The second show that I spent months coordinating, planning and designing took place on August 16th, 2017, from 9:30am-3:00pm at the Desert Diamond Casino and Hotel. Over 55 of our top vendors participating. Raffles, prizes, contests, promotional items, delicious food, live music and a hosted cocktail hour made for loads of fun! See below for all the details. 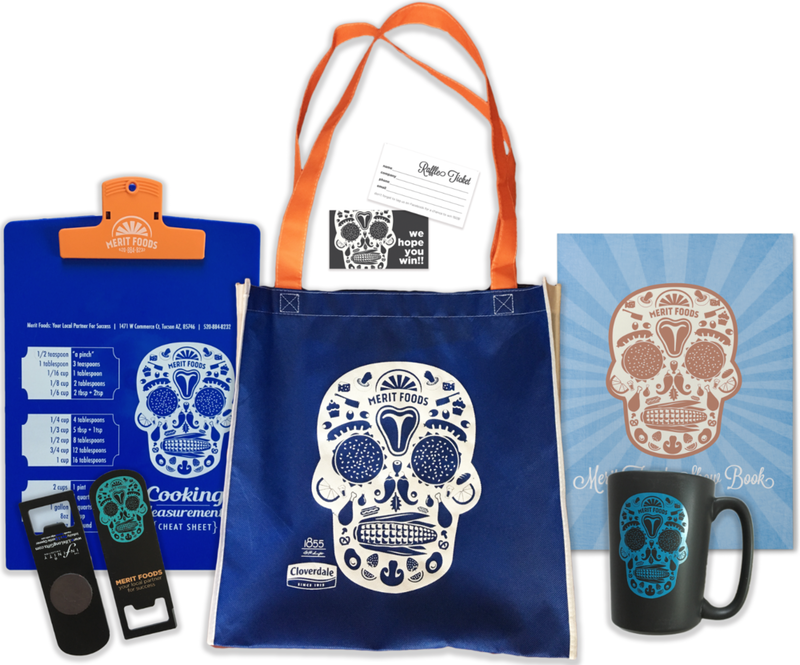 The 2017 theme was inspired by the Mexican Sugar Skull (a design that is well loved in Southern Arizona) with a foodie twist. The skull's features are made from food items: like his corncob mouth, hamburger eyes, and lime-wedge earlobes. This design was used on various promotional items, flyers, and digital marketing design. In fact, the design was so popular, that many of the 2017 show promotional items have been reordered by request! I completely reworked the Merit Foods Marketing Plan for 2017, from our offers and services to our prices. The Marketing Plan is where vendors are able to reserve a Full or Half Booth at the Customer Appreciation Show. Below are the last 3 pages of the extensive 2017 Marketing Plan, which shows the Comprehensive Plans (all which include a booth at the show along with some other goodies) and A La Carte Marketing Options that Merit Foods can provide. I also created the Mutual Growth Program (bottom right) for vendor-partners who are small and local, and cannot afford to pay like the big fish. I used the VIP promotional item (the Arizona Shaped Cutting Board) as the center of my branding photoshoot. After seeing the cutting board in various designs (invitations, facebook, etc.) customers were surprised and excited to receive one at the show! Customers had the option of registering for free either physically using our perforated invitations, or online using Google Forms prior to the show. ^^ the online registration was sprinkled with cultural references to spice it up! All Vendors participating in the Food Show received the Vendor Packet below. The packet was written and designed by me, and included key information about the event and information on how to book a hotel. It also included mandatory forms like the Food Allowances Form (what kind of discounts are they giving?) , Power Usage Form (do they need power at their booth?) and the Booth Request Form (where do they want to be located on the floor?). The Booth Request form provided incentive for vendors to fill out the paperwork ASAP, as it was a first come first serve service! Vendors shared the space comfortably with each other and our customers. Organizing the floor map just so, I made sure every vendor was located where they wanted to be, and that there was some wiggle room for any last minute changes. I created a Facebook event of the Customer Appreciation Show to further the reach, and posted daily about what to expect, what our Vendors bring to the table, and how to register. During this time, Social Media activity was up 60% than the months prior. Each customer received a Show Book upon arrival to the show. This book listed every discounted item from each Vendor participating, and included a schedule of events and map of the premises. Each employee received a breathable black shirt with a gray trim to wear on show day. The Merit Foods logo on the breast was embroidered in a gray to match the trim. Customers received a Promotional Bag at registration before entering the show. It was filled with Merit Foods goodies: clip boards with kitchen tips, t-shirts, baseball hats, pens, mugs, magnetic bottle openers, lip balm balls, and the 2017 favorite: fidget spinners. Promotional items were picked and designed by me, and provided and printed by Southwest Solutions in AZ and Magnets USA in VA.
40 of our top customers received a bamboo cutting board in the shape of Arizona, fully equipped with the Merit Foods logo! This promotional item was seen in the photographic branding leading up to the show, which was used on the design of the printed invitations, digital invitations, and the Facebook Event. We held our Raffle 3 times throughout the show--I picked prizes that included Flat Screen TVs, iPads, Surround Sound Systems, University of Arizona Coolers, Speakers, Gift Cards, Kitchen Appliances and more! ^^ one of the many boomerangs taken for the Merit Foods Instagram story! I organized a Facebook Live Competition to give customers a fun way to win money while Merit to gains more social media attention. Customers who posted a Facebook Live video at the show had five chances to win a cash prize, and customers who posted a selfie had one chance. Facebook Live is a great tool for social media marketing because friends are notified whenever somebody is creating a live post! As an added competition to encourage our vendors to follow through with customer interest, I created the Lead Sheet Competition. The vendor who collected the most names on their lead sheets was to win 500$, and the competition was stiff! In the end, RL Schrieber won by 2 leads. Near the end of our Show, guests were each given 2 Free Drink Tickets, good for any premium drink priced up to 6$. During the Cocktail Hour, a very talented group of musicians from Tucson, booked by yours truly, played a great Jazz concert. This gave our sales reps a great opportunity to socialize with our customers in a low-pressure atmosphere! After giving my notice at Merit Foods, I helped find and train my replacement. I made sure that Haley got to see the show first hand, and I can't wait to see how she tackles the project in 2018!